The other day when I checked with Google Structured Data Test tools, I came across these two problems: a value for the publisher field is required and a value for the author field is required. 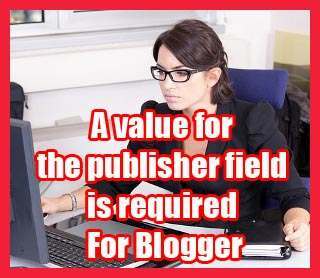 This post is about how to fix or solve this a value for the publisher field is required error found in Blogger. 3. Click on "Edit HTML"button. Note: Before you paste the block of code below onto your template, make sure you change the two lines (https://your-blog.blogspot.com) highlighted in white. They must be replaced with your actual Blogger URL. 5. Now you paste this block of code BELOW <data:post.body/>. 7. Then click on the orange color "Save theme" button. After that, go back to Google Structured Data Testing Tool and click on "NEW TEST" and then click on "RUN TEST" button. The error in red "a value for the publisher field is required" shouldn't be there anymore. *Here is how to fix datePublished missing and required error for Blogger.